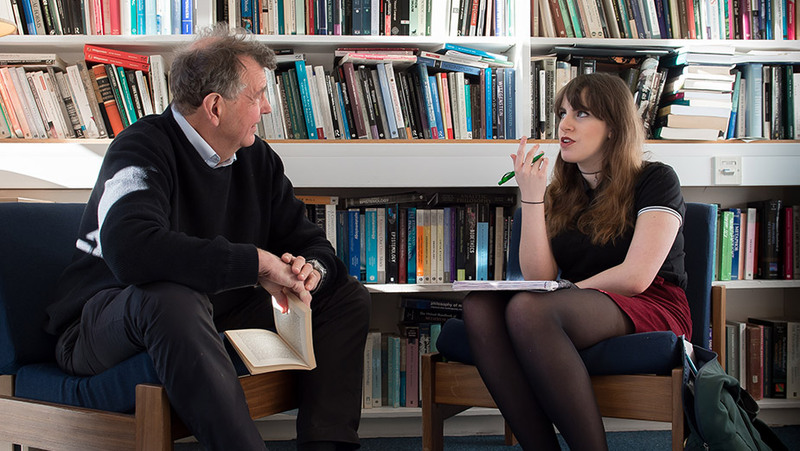 Studying Philosophy at Sussex means combining the traditional with the alternative, and exploring a range of unexpected approaches to the basic questions of philosophy. You get to study both analytic philosophy and continental philosophy – an opportunity rare at other universities – and choose from options such as Islamic and feminist philosophy. From the University’s lively Philosophy Society to Brighton’s Philosophy Café, you’ll be stimulated by culture and debate. Join our community and broaden your intellectual horizons within a trusted academic framework. You can get involved in philosophical debates, attend talks, and network with other philosophy students. Our supportive and stimulating community also encourages you to collaborate with other subjects. This means you can follow your own interests – so you can gain a range of transferable skills to prepare you for your future career. Advanced Welsh Baccalaureate Skills Challenge Certificate and two A-level grades AAB – ABB. Advanced Placement Tests with scores of between 554 to 544. At Sussex, you’ll gain the skills to handle complexity in every area of life. You’ll be confident to take on professional responsibilities. You’ll be prepared for jobs in fields such as journalism and writing, teaching, management and marketing.